Find out what it means to be a Rotman grad and part of a global alumni network at the New Alumni Kick-off. In less than six months you and your classmates will join a global network of alumni who are using their Rotman education to change their organizations, communities and the world. But your relationship with Rotman doesn’t end when you graduate, it’s just the beginning. Our hope is that you will stay connected and maintain a lifelong relationship with the School. 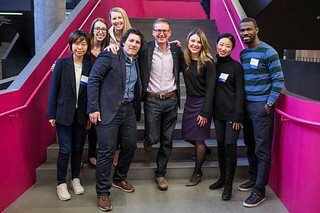 In order to make the most of the Rotman network, please join the alumni team on Saturday, January 26, 2019 at the New Alumni Kick-Off. Meet over 40 of your fellow alumni and connect with your classmates across all programs for a morning of interactive sessions designed to help you transition from student to alumnus. Daniel Debow is a Canadian entrepreneur and angel investor. Daniel was the co-founder and CEO of Rypple, which was acquired by salesforce.com in 2011 and rebranded as Salesforce Work.com, a social performance management platform. At Salesforce, Daniel was SVP, Emerging Technology, responsible for developing and launching new wearable solutions from concept to mainstream adoption. Prior to Rypple, Daniel was on the founding team of Workbrain, a workforce management software company. Daniel led Workbrain's sale to Infor in 2007. In 2015, Daniel was recognized as Canada's Angel Investor of the Year. Daniel holds a JD/MBA from the University of Toronto and an LLM in Law, Science and Technology from Stanford University. He is an Adjunct Professor at the Faculty of Law, University of Toronto and a Founding Partner of the Creative Destruction Lab at the Rotman School.